Using its antibiotic renewable technology, Helperby Therapeutics is developing a new class of antibiotics with activity against multidrug-resistant bacteria, including strains with transferable resistance to carbapenems and colistin. The global antibiotic crisis is putting the future of modern medicine in jeopardy. Doctors increasingly rely on last-resort antibiotics, such as carbapenems and colistin, but this final line of defense will fail eventually as new resistance mechanisms continue to emerge and spread rapidly. It has been more than 40 years since a new class of antibiotics with activity against Gram-negative bacteria was last introduced to the market. The world’s most dangerous bugs, defined by the World Health Organization (WHO) as critical priorities with an urgent global need for new treatments, are all Gram-negative bacteria that have developed resistance to carbapenems: Enterobacteriaceae (CRE), Acinetobacter baumannii, and Pseudomonas aeruginosa. Helperby Therapeutics is a biopharmaceutical com­pany dedicated to developing the next generation of life-saving antibiotics. Based in London, UK, with subsidiaries in the US and Ireland, Helperby is one of a handful of companies in the world with compounds in clinical development that are active against all three WHO critical priority pathogens. The discovery of novel antibiotics is a challenging process that struggles to match the rapid rate of emerging resistance, so Helperby is taking a different approach to tackle the antibiotic resistance crisis. The company specializes in the rejuvenation of existing antibiotics by combining them with antibiotic resis­tance breakers (ARBs) to create a whole new genera­tion of therapies. One of Helperby’s lead candidates combines azido­thymidine (AZT) with colistin for the treatment of urinary tract infections (UTIs). AZT is a well-known antiretroviral drug that is also active against Gram-negative bacteria (it inhibits bacterial DNA replica­tion)1 but has not been used previously as an anti­bacterial. Helperby recently presented data from its preclinical and phase 1 trials at the 28th European Congress of Clinical Microbiology and Infectious Diseases in Madrid2,3 (Fig. 1). Fig. 1 | A new treatment for critical priority bacterial pathogens2,3. Helperby tested the activity of AZT alone and in combination with colistin against a variety of multidrug-resistant bacteria, including seven New Delhi metallo-β-lactamase 1 (NDM-1) CRE strains, 13 colistin-resistant mcr-1 strains of Escherichia coli (kindly supplied by Patrice Nordmann), and 54 antibiotic-resistant strains isolated from Asian coun­tries. The results showed that AZT is active against CRE and against colistin resistance. 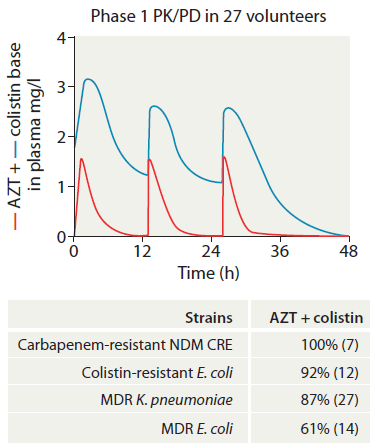 Importantly, AZT had a significant synergistic effect in combination with colistin, producing rapid bactericidal activity against the highly dangerous NDM-1 Klebsiella pneu­moniae and mcr-1 E. coli. The therapeutic effectiveness of AZT in combina­tion with colistin was also tested in a bacterial pre­clinical infection model. The combination treatment killed CRE NDM-1 K. pneumoniae, leading to a signifi­cant reduction in log (colony forming units (CFU)/ml) at 6 hours after treatment compared with either AZT or colistin alone. Formed in 2002 as a spin-out company from St George’s, University of London, UK, Helperby is based on the scientific research of Coates and Yanmin Hu, the company’s director of research. Using its propri­etary antibiotic renewable technology, Helperby has discovered and is developing a suite of ARBs that, when combined with old antibiotics, can restore the original potency against both Gram-negative and Gram-positive bacteria. Resistance will inevitably arise again but, with this technology, it may be pos­sible to continue to renew old antibiotics by combin­ing them with a second ARB, and so on. Helperby has a broad portfolio of promising devel­opment candidates that utilize its novel ARBs, ranging from market ready candidates to those in preclinical development. Along with AZT and colistin for UTIs, the pipeline includes treatments for intra-abdominal infections, cystic fibrosis, and the prevention of surgi­cal staphylococcal infections. The company is actively seeking partners to help bring its new therapies to market, including the patented combination of AZT and colistin. “We are offering the opportunity to partner a company which has potentially the first new class of antibiotics for Gram-negative infections to reach the market in over 40 years,” said Coates. Helperby also works with other companies, and helps to rescue their antibiotics from resistance. “Unfortunately, resistance is rising more quickly than the pace of drug development, so if a company sud­denly discovers that widespread resistance has arisen during the development of their new antibiotic, we can help find an ARB to boost it,” said Coates. Elwell, L. P. et al. Antimicrob. Agents Chemother. 31, 274–280 (1987). Coates, A., Liu, Y. & Hu, Y. Azidothymidine is bactericidal against carbapenem-resistant Enterobacteriaceae and produces syner­gistic activity in combination with colistin against multidrug-resistant Enterobacteriaceae. Presented at the 28th European Congress of Clinical Microbiology and Infectious Diseases, Madrid, Spain, 21–24 April 2018. Naber, K. G. et al. Safety and pharmacokinetics of i.v. azidothy­midine alone and combined with colistin being developed for the treatment of carbapenem- and colistin-resistant Enterobacteriaceae (phase-1-study). Poster presented at the 28th European Congress of Clinical Microbiology and Infectious Diseases, Madrid, Spain, 21–24 April 2018.